second graders to boost literacy and enable their success in school. Children spend the first three years of elementary school learning to read. From that point onward, they read to learn. That’s why literacy is crucial from an early age, and it’s why Fre3dom Interiors read to children through Kansas City’s Lead to Read KC program, which recently was featured on NBC Nightly News. As Lead to Read volunteers, we read with a student for 30 minutes once a week in classrooms at Garfield Elementary in Kansas City, Missouri. ground for improving literacy in the schools. 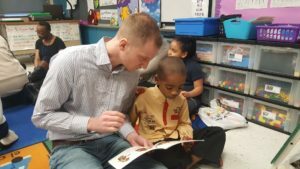 In 2017, test scores show third grade reading proficiency in Kansas City is 55 percent, up from 33 percent in 2011 when Lead to Read KC started. With help from volunteers like the ones from Fre3dom Interiors, that figure is expected to continue increasing. To join, go to LeadtoReadkc.org, click the “Become a Reader” tab.